Best thing I’ve seen on the Internet so far today is: SOCK WARS So of course I MUST talk about it. I want to take part but the fact of parting with a half knitted object would be painful for me. Very very tempting though even if I have never finished a pair of socks. meh. cant be bothered with work, with reports, with stuff that concerns sitting at staring at a computer all day. Scotty is at home having a couple of days off before his new job and I’m sitting at a desk trying to get a semblance of desire to achieve anything at all today. It does not help that I’ve been doing the same job for a week shy of 7 years. I’m usually quite contented with it, its a good job. Mostly I cant complain but there still is that nagging feeling that I’d rather be elsewhere trying to do something that floats my boat, that makes the hours disappear with a mere blink of an eye. You know the sort of thing, the stuff that dreams are made of, having my own alpaca farm or yarn shop or being creative at home. Some days I just wish I could have some time as a housewife to get time to put everything in order. Although that would be nice, I do love my colleagues and I have a level of respect and support I need, also a level of freedom and self reliance that I adore in my job that will be difficult to find elsewhere. Its not complicated especially after doing it so long. Its not rocket science but its a matter of caring about what I do. For now I’m seriously loosing that care. I will not let it show though, I do just knuckle down and get on with it. Still the temptation to streak the office and tell them all where to go is ticking away in the back of my mind. It will never happen but you can bet I’m thinking about ways of departing with flamboyance of someone who’s just won the lottery, taken a few happy pills and decided they have nothing to loose. there are several small items to cover today. 1, knitting scouts! I’m not going to put the badges up for myself but for those out there who knit, they are funny and cool. I’ve been meaning to link them for a while and have just not got around to it. As you can see this blog is badge and button free. I try and keep things clean and tidy. Which reminds me, i’ve got loads of people to add as links in the friends and knitting blogs sections. I just don’t get round to it again! I’ve given up playing kingdom of loathing. It was great fun for a while but at the point I had to repeat the same actions just to get anywhere every day I got bored. I gave Scotty all my collections of bits and bobs. I removed my Mr Accessory and therefore over time the account will be removed. I don’t regret playing and now at least I understand when others wibble on about it. I just don’t have time to play and do other things that are more important. Now normally I put up small linking pictures to flickr but in this case you need a larger image. Now how cute is that! he’s an absolute darling and always wanting a hug. 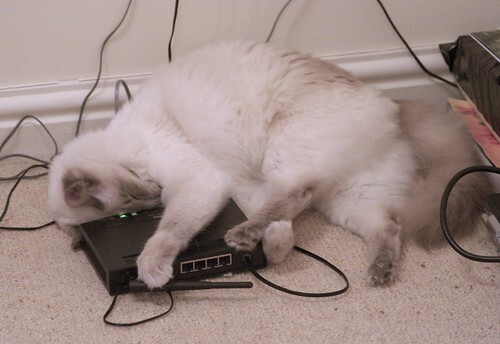 This time he went to the router for a hug. We are seriously considering getting another indoor cat that can be his friend. He is way too lonely in the day. I wish we could both be home more but we cant. He seems happy enough but there are tell tale signs that he needs just a little extra company. I took some photos of the chutney and chutney jars and plums and tamarind. Its easier just to give you short links on those. Last night I chopped all the apples given to us from mum and dads garden (old garden as they move TODAY!) cooked them up and added back all the plum and tamarind chutney. It was very vinegary, we cooked it down and added over a kilo extra sugar. Now its more like it should be, deep and fruity and sweet. We have 4 of the big square jars full and two smallerish jars full. I measured against the pan before putting in the jar and there was around 7 leters. So who wants chutney? I cant post it but you can come and collect. damn I forgot about erasmus in pants. Maybe I’ll surprise you one day with it. well as you ask yes! that 3.25Kg of plums were de stoned and cooked in my 8L pan. I love this pan for mass cookery. Not something I often mention but I can and do have the ability to cater for many all at once, mainly in indian style. Thats one of the main benefits I gained from spending some time with the Hare Krishnas. I love them guys. Well this time Scott was helping out and he nipped to the shop to get vinegar and bits and bobs. As I was doing other things Scott looked at the weight ratios for fruit to vinegar and placed them in the pot accordingly so we could get cooking. I wanted to make tamarind and plum which looks fab but I forgot because tamarind is a sour flavour like vinegar, we did not need as much. Hours of cooking later it tastes nice but more like sweet and sour sauce than chutney. We now have around 5L of slightly too sharp chutney that is a bit runny. Ho hum. I’m going to attempt a rescue mission this evening containing apples and loads more sugar. Tamarind is great though its like the essence of sour sweets that make the back of your mouth water. I also noticed that the bed sheets that I bought on Friday, one was the wrong size so Monday morning I nipped in to a lovely quiet city to swap the sheets. Whilst I was there I went to see if I could find a corset that would fit so I could get used to wearing one prior to my wedding dress. Ann Summers to the rescue! for 50 of the earth English pounds I now have a simple black satin corset that can be dressed up or down as required! its a bit big if anything but hey its nice to have the laces done up without any gaps in the back. I can even do them up myself. Sorry I just cannot do gappy bits especially in my lower back. I swear it just makes me cold all through and gives me back ache. This is why you’ll never see me with flunge aka muffin tops *shudder* even in summer. I took some photos of the chutney process, I’ve just not got them off the camera yet. 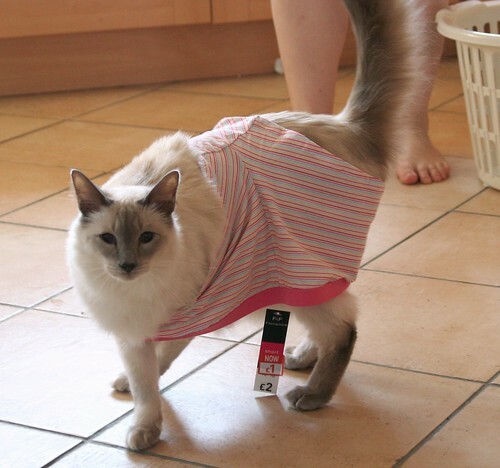 Oh and I got a new pair of pants and Erasmus stole them ( kicked them off the sofa and tried to drag them away) so I made him wear them for the camera. Its hilarious, no really it is. I’ll show you another day. So Friday was spent going shopping for presents and food and stuffs. I found some sheets on sale in house of fraser for the bed. popped in to vanilla and tried on some corsets, they were beautiful but the shop was very much a boutique only stocking smaller sizes. Popped over to see mum and dad on Saturday. Had a great time helping them clear out the loft. They are moving next week and had to get everything cleared out. So many memories past my eyes coming out in boxes. We took a walk around wells and collected some apples pears and tomatoes for cooking up. The garden was full of stuff so the more taken away the better. That evening I made green and red tomato chutney, slightly spicy but great. I took the tomato chutney with us and it went down very well indeed. green and red tomatoes, red onion, 2 chillies all chopped and thrown in a pan. I deseeded my chillies to make it milder. cook down and add a half a pint of vinegar. I used half malt, half raspberry. cook up, then once reduced a fair bit add a metric shedload of sugar. Notice I’ve not given out any measurements, mainly because I forgot to make any. keep cooking until going slightly gloopy. At this point I semi blended it to remove the bigger lumps and make it easier to get out of the jar. et voila.. chutneylicious, jar up and give to people. just pause a moment. I’m off to go and help my parents move some boxes about. I do have things to say just not enough time to say them. BRB and talk soon. exactly one year today (and looking at my watch – in 5 minutes) I will be married. Its nice to have an aim, something we can both look forward to. I have tomorrow off as holiday and I have a list of things I need to do that is as long as my arm. Although I’m tempted to spend most of the day in bed knitting or sleeping. I’m tired, over all i’m not sleeping my best. I go to bed too late, I never want to wake up. Plus Norfolk has been stuck in a wet grey haze for around 4 days which is helping zap any will to get out there and achieve. What happened to a good English summer? It completely disappeared on us. There was one good weekend in early August and a week in May. That’s not a summer, its criminal. I heard a friend say they were going to make a complaint. It was a joke but I still wonder who could you complain to about the weather. I do love how the English can make weather a discussion in all circumstances, almost like a sport. Yesterday was Dad’s birthday, I gave him a call as I could not be there to see him. We’ll see the whole family on Sunday at my brothers house. It was also Scotty’s dads birthday too. I think they are the same age… I should know, I’m just a bit lapse with stuff like that. One last thing, please please remind me not to eat too much cheese. I feel sick and I’m sure its cheese that does it. I LOVE cheese, but from recent days I have proven it does not love me. Nothing major just I become a mucus filled mess and feel queasy. Oh well. This post was meant to be good and happy, I’ll try and be happy tomorrow instead. You are currently browsing the Jiva a soul in transit blog archives for August, 2007.